The joint along the axis of tube at which the two edges of the original coiled stock are rolled together to create the tube. 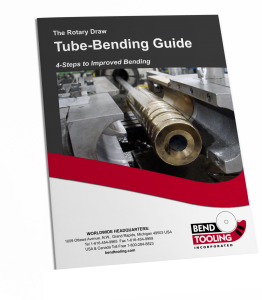 Usually the seam is not a matter of concern in tube-bending, unless it consists of a weld that protrudes excessively into the inside diameter of the tube and causes interference with the mandrel. The problem of an excessive seam, short of replacing the tubing material, can be addressed in two ways:  Machine a groove into the mandrel that is sufficiently deep and wide to clear the seam; or  reduce the diameter of the mandrel to minimize interference with the seam. Both of these solutions have significant drawbacks. If the mandrel is grooved, then it acquires an orientation that must be maintained relative to the tube. This complicates the loading of material, especially if the grooved mandrel balls are not fixed in same manner to prevent their rotation. If the mandrel is reduced in diameter, then its effectiveness in controlling wrinkling and reduction is decreased — although this side-effect can be partially offset by setting the mandrel nose deeper into the bend. However, once the mandrel is compromised in its design to accommodate a weld seam, bend quality will be limited.